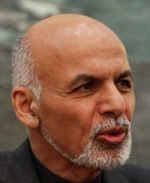 Khaama Press: President Mohammad Ashraf Ghani has said he does not want an apology from the British Prime Minister David Cameron for describing Afghanistan as ‘fantastically corrupt’. In an interview with BBC Radio 4’s Today program, Ghani said Afghanistan was “one of the most corrupt countries on earth”. Click here to read more (external link). This weirdo really talks smart sometimes. HE IS A CURRUP PUPPET WHO IS TOTALLY CONTROLLED THE ANGLO/US WAR CRIMINALS. THE WAR MONGERS ARE THERE TO EXPLOIT AND STEEL THE NATURAL RESOURCES OF AFGHANISTAN AND HUMILIATE THE ORDINARY GOOD RELIGIOUS FOLKS OF OUR COUNRY. You have turned yourself to an epidemic disease in Afghanistan ! ALL THE PEOPLE OF THE REGION KNOW THAT!